Italian police are investigating the theft of some $16m (£10m) in cash and jewellery from a Saudi princess staying on the Italian island of Sardinia. The thieves used a master key to gain entry to her luxury hotel suite in Porto Cervo before ripping a safe from the wall, Italian media reports say. They said the safe was only fixed with silicon to the wall in the suite. Officials have not named the princess but say Italian and Saudi diplomats have had talks about the incident. “The thieves used a master key. In 10 minutes at dinner time, without making any noise, they managed to remove the safe from a suite occupied by the Saudi princess,” Italy’s La Stampa newspaper reported. The hotel is located in one of the most chic resort areas on the Italian island. 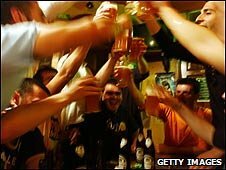 Milan has banned the consumption and sale of alcohol to young teenagers in an effort to curb binge-drinking. Parents of children under the age of 16 caught drinking wine or spirits will be liable to heavy fines of up to 500 Euros ($700;£450). A third of 11-year-olds in the city have alcohol related problems, it says. In a country where for centuries wine has been part of local culture – and prohibition would be unthinkable – the ban has come as a shock. But the authorities are deeply concerned about the increase in consumption of alcohol by children as young as 11 in the country’s industrial and financial capital. So as an experiment, supplying alcohol – either wine or spirits – to youths under the age of 16 in bars, restaurants, pizza shops and liquor stores will be banned. Heavy fines will be imposed on the parents of offending children and on shopkeepers or bar owners who serve them. A national law banning the sale of alcohol to under-16s is only loosely enforced, as Italian families are used to sometimes giving young children a teaspoon of wine as a family party treat. In past centuries, Italian children would sometimes even be given wine to drink in preference to water which was often polluted. There has been a storm of protest by bar owners who refuse to act as alcohol police for young people. But changing social customs mean that old easy-going attitudes towards consumption of alcohol in Italy will have to change. At a G20 warm-up meeting in Chile, Mr Biden said heads of state would agree proposals to remedy the crisis at next week’s meeting in London. As they spoke, tens of thousands of protesters marched in the UK capital and in Germany, France and Italy. US billionaire George Soros told the news the G20 meeting was “make or break” for the world economy. “Unless they do something for developing world there will be serious collapse in that part of the world,” Mr Soros said. “Hopefully we can make it clear to them that we’re going to walk away from this G20 meeting with some concrete proposals,” he said. British Prime Minister Gordon Brown said he understood why people were demonstrating in the UK. “We will respond to [the protest] at the G20 with measures that will help create jobs, stimulate business and get the economy moving,” he said. But Brazil’s President Luiz Inacio Lula da Silva told the Chile meeting that everyone was suffering from the recklessness of those who had turned the world economy into “a gigantic casino”. “We are rejecting blind faith in the markets,” he said. In London on Saturday, demonstrators demanding action on poverty, jobs and climate change called on G20 leaders to pursue a new kind of global justice. Police estimated 35,000 marchers took part in the event. A series of rallies are planned for Wednesday and Thursday by a variety of coalitions and groups campaigning on a range of issues from poverty, inequality and jobs, to war, climate change and capitalism. There have been reports that banks and other financial institutions could be targeted in violent protests. British officials have put a huge security operation in place. 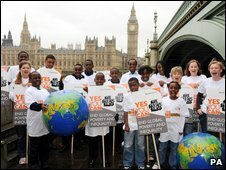 Before the London summit, Mr Brown has been visiting a number of countries trying to rally support for his economic plans. In Chile on Friday he said people should not be “cynical” about what could be achieved at the summit, saying he was optimistic about the likely outcome. But in an interview, German Chancellor Angela Merkel dampened expectations of a significant breakthrough. In the Italian capital, Rome, several thousand protesters took to the streets. In Paris, around 400 demonstrators dumped sand outside the stock exchange to mock supposed island tax havens. US shares have fallen sharply with investors cautious over whether the House of Representatives will back the revised bank rescue plan. The House is due to discuss the scheme later, with a vote expected on Friday. The bill successfully passed through the US Senate on Wednesday. 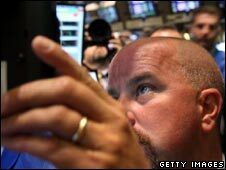 On Wall Street, the Dow Jones index was down 263 points or 2.4% at 10,571, a slide dragging European shares lower. The falls came as France said it would host a summit on the financial crisis. The UK’s FTSE 100 closed was down 1.8% to 4,870.3 points while Germany’s Dax index shed 2.5% and France’s Cac 40 lost 2.3%. Sentiment was further hit by glum economic data – showing that the number of people filing for new unemployment benefit claims rose to a seven-year high, while factory orders had seen a steeper-than-expected drop in August. The office of French President Nicolas Sarkozy said the special meeting on Saturday would discuss a co-ordinated response to the financial turmoil amongst European members of the G8 ahead of a meeting of world finance leaders in Washington next week. 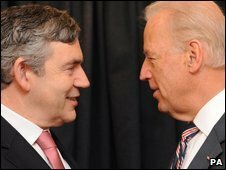 UK Prime Minister Gordon Brown is due to attend, together with German Chancellor Angela Merkel, Italian Prime Minister Silvio Berlusconi and European Central Bank President Jean-Claude Trichet. But with just two days to go before the talks start, EU members are deeply divided, correspondent said. France and Holland favor a European response to help banks hit by the credit crisis while Germany and Luxembourg believe a joint rescue plan is not necessary. European leaders have denied speculation that they wanted to establish a unified 300bn euro ($418.4bn; £236bn) banking rescue deal along the same lines as the US plan. The rescue idea was said to be being proposed by France, but Mr Sarkozy insisted that there were no such plans. “I deny both the amount and the principle [of such a plan],” he said. In the US, a number of changes had to be made to the $700bn (£380bn) bail-out plan in order to help win approval in the Senate. These include raising the government’s guarantee on savings from $100,000 to $250,000, tax breaks to help small businesses, expansion of child tax credit, and help for victims of recent hurricanes. President George W Bush said that the package was “essential to the financial security of every American”. However, economists said doubts remained about how effective the package would be. “Investors are still concerned about the efficiency of this rescue plan and how it can help the global economy,” said Aric Au of Phillip Securities in Hong Kong. US presidential hopefuls John McCain and Barack Obama, who both returned from the campaign trail for last night’s Senate debate, voted in favor of the rescue plan. Senate majority leader Harry Reid, a Democrat, said he was happy with the result and praised both presidential candidates for voting. “I think it shows that when we work together we can accomplish good things,” he said. Mitch McConnell, leader of Republican senators, was also in jubilant mood. “This was a measure that was much needed, to unfreeze the credit markets and get America’s economy working again,” he said. A group of Western tourists and their Egyptian guides, who were kidnapped 10 days ago by gunmen, have been freed. The 11 hostages – five Italians, five Germans and a Romanian – and some eight guides are said to be in good health. The group, abducted in a remote border region of Egypt, have now arrived at a military base in the capital, Cairo. Egyptian officials said they were freed in a mission near Sudan’s border with Chad, and that half of the kidnappers were killed. No ransom was paid. The freed hostages were greeted by Egyptian military and government officials on arrival in Cairo as well as foreign diplomats, and were then taken for medical checks. Sudanese authorities had been tracking the group since early last week through a remote mountainous plateau that straddles the borders of Egypt, Libya and Sudan. They were seized in an ambush at around dawn on Monday, Egyptian security sources said. Some 150 Egyptian special forces were then sent to Sudan, officials said. German officials had been negotiating via satellite phone with the kidnappers, who were demanding a ransom of $8.8m (£4.9m). Egyptian officials said no money exchanged hands. Italy’s Foreign Minister Franco Frattini said that Sudanese and Egyptian forces had carried out “a highly professional operation”. He added that “Italian intelligence and experts from the special forces” in Italy and Germany had been involved. Egypt’s defense minister said that half of hostage-takers had been “eliminated”, without giving precise figures. Reports suggest that Egypt’s tourism minister will be relieved. The abductees had been touring in an area well off the beaten track but a messy end to this crisis would not have been good for the health of the Egyptian economy, our correspondent says. The two suspects claimed the tourists were in Chad but their exact whereabouts at the time of rescue remains unclear. Chad denied the group was within its borders. In a statement, the military said the vehicle of the hostage-takers was full of weapons and documents detailing how the ransom should have been paid. Other documents found inside led the army to believe a faction of the Darfur rebel Sudan Liberation Army was involved in the kidnapping. None of Darfur’s numerous rebel groups have said they were linked to the kidnappings. Other reports said the abduction, near the Gilf al-Kebir plateau, was carried out by tribesmen or bandits operating in the area. 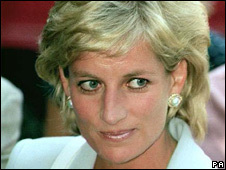 A British photographer who took pictures of Princess Diana on Mohamed Al Fayed’s yacht has been ordered to pay damages to the Harrods owner. Jason Fraser, 41, was cleared two years ago of breaking French criminal privacy laws by taking the photos in 1997. But a court in Paris overturned the verdict and ordered Fraser to pay Mr Al Fayed 5,000 euros (£3,900). He was also fined a total of 3,000 euros (£2,400). Fraser, of London, said he hoped the latest ruling would be overturned. “I remain confident and would expect a French supreme court to now confirm my continuing faith in the common sense of the French legal system,” he said. The publishers of France Dimanche, which printed the pictures, were fined the same amount. The photographs, which show the princess kissing her boyfriend, Mr Al Fayed’s son Dodi, were taken just days before the couple were killed in a Paris car crash in August 1997. The yacht was off Portofino on the Italian Riviera but proceedings were able to take place in France because the photos were printed in British tabloids on sale in the country and featured in local publications. Italy’s troubled national airline, Alitalia, cannot guarantee flights beyond Sunday because of a lack of funds to buy fuel, a top official says. “Until the end of tomorrow, flights are guaranteed. 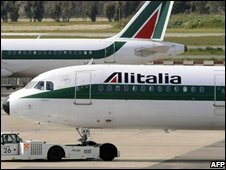 From Monday, they are not,” Augusto Fantozzi, Alitalia’s bankruptcy administrator, told unions. Mr Fantozzi was speaking as he called the unions to emergency talks a day after the latest session broke down. Prime Minister Silvio Berlusconi blamed “political” motives for the failure. He said he would do all he could to save Alitalia from collapse. “The executive is always ready… to give all the possible support to get to the only solution possible to avoid the airline going bust,” he told the Italian news agency Ansa. Italian investment consortium CAI, which was poised to take over the company’s profit-making parts, walked away from talks with the unions on Friday, accusing them of intransigence. CIA chief executive Rocco Sabelli said on Saturday it was not ready to make any further concessions. Italians are quite used to feeling “lo stress”, looking forward to “il weekend” or trying to look “cool”. But now an influential cultural institute has asked Italians to protect the language and reject “Anglitaliano”. 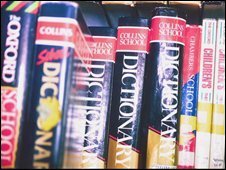 The Dante Alighieri Society asked people for examples of over-used foreign words and “il weekend” emerged as the worst offender. The society said the results showed that Italians want their language to receive more respect. For four months, the society asked visitors to its website, 70% of whom were Italians, for inappropriate examples of foreign words being used in everyday Italian, either written or spoken. The least popular word was found to be “weekend”, receiving 11% of the votes. “Too short? No, just not Italian enough,” the society adds. They said it was pointless to use an English word, however elegant, when the Italian expression “fine settimana” means exactly the same thing. The second least popular word was “OK”, which respondents to the survey thought was too informal and unprofessional. Several unpopular terms came from business and politics, with “briefing” gaining 5% of the vote, “mission” 4% and “devolution” 3%. “It is clear that the Italians are asking for more respect and more protection for their language,” says the society. Italians, however, are divided on whether they want to throw out English terms in favor of flawless Italian. Alessandra, a secretary at a travel agency in Rome, said she thought the change was a product of globalisation. “I don’t think it matters if we use English words,” she told the UK’s Telegraph newspaper. However her boss Maria disagreed, saying she would prefer to speak either Italian or English, not a mixture. “People think it’s chic to use English words, but I don’t like it at all. It’s important to keep language clean,” she said. The society conducted the survey as part of its campaign to ensure Italian remains a key language in the workings of the EU. Italian Prime Minister Silvio Berlusconi has signed an agreement to pay Libya $5bn as part of a deal to resolve colonial-era disputes. Libyan leader Col Muammar Gaddafi said the settlement signed in the city of Benghazi opened the door to partnership between the two states. Mr Berlusconi said the deal, which sees the money being released over 25 years, ended “40 years of misunderstanding”. Libya was occupied by Italy in 1911 before becoming a colony in the 1930s. The former Ottoman territory became an independent country in 1951. This is the first African country to be compensated by a former colonial master. The question is, she adds: will this latest move set precedents for other former African countries to follow suit? Mr Berlusconi explained that $200m would be paid annually over the next 25 years through investments in infrastructure projects, the main one being a coastal motorway between the Egyptian and Tunisian borders. There will also be a colonial-era mine clearing project. 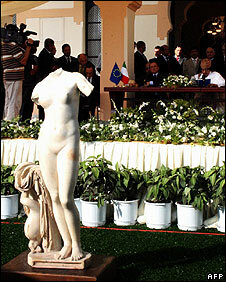 As a goodwill gesture, Italy also returned an ancient statue of Venus, the headless “Venus of Cyrene”, which had been taken to Rome in colonial times. The settlement was a “complete and moral acknowledgement of the damage inflicted on Libya by Italy during the colonial era”, the Italian prime minister said. 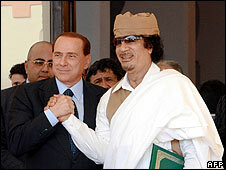 “In this historic document, Italy apologises for its killing, destruction and repression against Libyans during the colonial rule,” Col Gaddafi said for his part. The agreement was signed in the Benghazi palace which once housed the Italian colonial administration, Reuters news agency reports. Rome and Tripoli have spent years arguing over compensation for the colonial period. Mr Berlusconi’s one-day trip was his second since June when illegal immigration from Africa to Europe was the key issue of talks. Italy has been swamped by thousands of African migrants trying to reach its shores by boat. Libya has come in from the diplomatic cold since 2003 when it abandoned efforts to acquire weapons of mass destruction. Next week, US Secretary of State Condoleezza Rice is scheduled to make the first high-ranking American visit to Libya since 1953.